An ESL lesson plan containing activities, games and resources for teaching the passive voice to intermediate level ESL students. If you're an iOS or Android user, try this lesson out on the TEFL Handbook app. It gives you offline access to all of our materials, perfect for quick reference in the classroom. 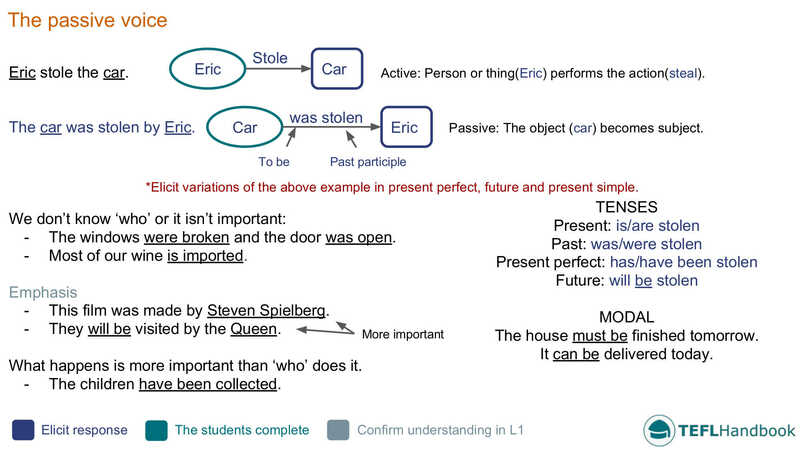 The sample board below illustrates one to introduce the passive voice. Start off by transforming the example active statement into its passive equivalent, eliciting as much as possible. After that, elicit some variations of that statement in different tenses. 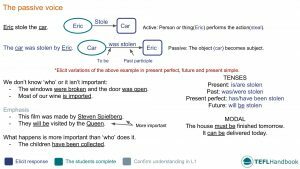 Finally, step through and explain the functional uses of the passive voice. 1. Thousands of people watched the match on television. 2. Steven has fixed the flat tyre. 3. Every July, the Smiths send their son to summer camp. 4. I will clean the car every Saturday. 5. The council recycles millions of glass bottles every year. 1. The match was watched by millions of people. 2. The flat tyre has been fixed. 3. The Smith’s son is sent to summer camp every July. 4. The car will be cleaned every Saturday. 5. Millions of glass bottles are recycled by the council every year. Assign one process to each group and brainstorm any vocabulary you think they might need on the board. Tell them that they must use the passive voice as much as possible. When finished, groups read their descriptions to the class. Listen for missed opportunities to use the passive voice and elicit suggestions from the other students. Here is one idea for a game that English teachers can use to practice the passive voice. As usual, we only include game ideas that require no more than a whiteboard, markers and dice. 1. English is spoken by dangerous people. 2. Thousands of cars were stolen by monkeys. 3. The Pokémon was killed by Antonio Banderas. 4. McDonald's has been robbed by Manchester United. 5. The horses will be ridden by angry penguins. To make it easier for the students to organise their explanations, divide the sentence on the board into three parts. The subject, verb and object. If you've found these ideas useful, be sure to check out our complete list of ESL lesson plans for intermediate level students. For other levels, see the entire collection of ESL lesson plans. Also, iOS and Android users can access all of our materials through the TEFL Handbook app. An ESL lesson planner for English teachers.